We all dream that our child is going to leap out of bed in the morning and rush to the piano to practice without even being reminded. Of course, this does happen from time to time. 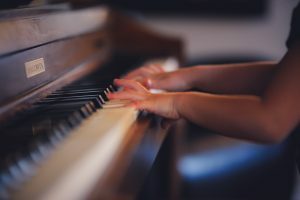 But for the majority, no matter how keen our children are to progress on their instrument, motivating music students to go to the piano and practice can be difficult at times. Distractions are everywhere. What parents need to remember is that practicing an instrument can be tedious and at times a bit overwhelming. It can even feel like a lonely pursuit, especially if the piano is in a separate room from other family activities. 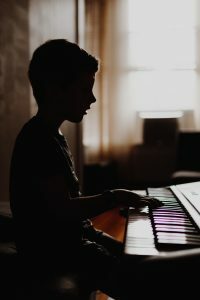 Here are some tips on how to motivate students to practice piano more productively and happily. A good piano teacher will motivate students to practice piano by teaching them exactly HOW to practice. Warming up with scales is a good place to start. Then move on to a piece they are learning, taking one or two measures at a time and practicing each hand separately. Finish the practice session by playing through pieces they already know and enjoy playing. When students are just starting out, reading music can be a struggle, so it’s best for the parents to check with the teacher that the student knows where to place their hands to get started. Teachers and students usually keep a notebook where everything they’re working on is listed and the teacher writes exactly what to practice, how to practice it, and in what order. For instance, they might write “Piece A: work on the right hand alone from the beginning to the end of line 2. Then work on the left hand. Try putting the hands together for two measures”. The more specific the teacher is, the more the student will feel confident practicing alone. Being alone at the piano with a list of things to get through can be overwhelming. Balance things out by staying with your child for a few minutes while they show you what they’re learning and how they’re practicing it. Ask them to teach you a few notes of what they’re learning. This gives their confidence a boost and furthers their understanding of the music. 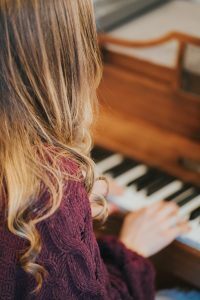 Knowing that you’re interested and monitoring their progress can really motivate students to practice piano. They want to make you proud! Have them perform a piece for you and shower them with praise. Better yet, have a concert in your living room on a certain day every week – just for family. Everyone attends to listen and those who play an instrument can also perform. 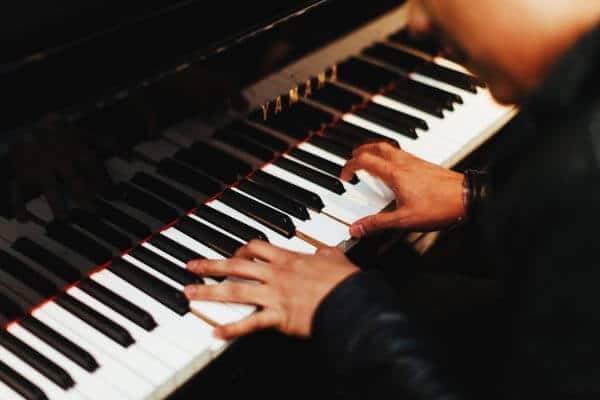 This gets them used to performing for an audience and when it comes time to play in school or in a “real” concert, they are more likely to feel ready for it. It can be great fun if the child makes a plan of what they’ll play and creates a “Program” which can be as simple or as elaborate as they like. They can dress up for the concert too! This is a sure-fire way of motivating music students which makes it even more exciting! Having a sticker chart can hugely motivate students to practice piano, especially younger children! Get a sheet of enticing stickers and have your child aim to collect the entire sheet. Some children get up bright eyed and bushy tailed and love to practice before going to school. If your child is like that, encourage this routine as it will get the best results. For other children, getting home from school is the best time. But motivating music students after a day at school can be harder. Consider giving them half an hour of downtime before they start practicing, and the results might be better. How long a practice session should bt depends largely on the student, their level, whether or not they are working toward an exam or performance, and their age. For beginners who are aged around 6 or 7, ten minutes a day should be plenty, to begin with. For older children who are also practicing scales, 30 to 45 minutes should be about right. Advanced students should do an hour or longer. In the early days, let your child decide how long they want to practice for and let them decide what to play – even if it seems like a lot of playing around! If a piano student feels in control of their practice sessions, they are much more likely to enjoy it. Don’t use a timer! It’s far more important that a student is engaged for the entire time they’re practicing than filling a set amount of time. Ten minutes of intensely engaged practice is worth far more than sixty minutes of thoughtless repetition of scales. Motivating students to practice piano is far easier if the piano is invitingly open and within sight. Motivating music students to practice is much more difficult if the television is in the same room as the piano. It cuts into potential practice time. Having the piano in a different room where the student can go very easily and start playing is paramount. But, as stated before, make sure the student doesn’t feel isolated. If the piano has to be near the TV, prioritize piano practice and have a fixed time when the TV is allowed on. Motivating music students can be aided by using a music practice app or music education app. There are some excellent music practice apps available. These give the student support during practice sessions, including keeping track of how long they’ve practiced and even rating their performance. There are games that will motivate students to practice piano as well as strengthen note reading and rhythm skills. Some apps will let the student communicate with their teacher if they need help, and even share a recording of their latest practice session. For some students being able to play is its own reward – and ideally, this is what we want. But most children will go through stages of being very keen and then not so keen. To get them through the not so keen patches, dangling a reward can do the trick. But rather than saying “Do 30 minutes and then you can have some gaming time”, it’s better to be specific: “Learn one line of your new piece hands together…” This gives them a very real target to achieve, rather than just time to pass. Whatever they achieve in this time, and however long it takes them, give them their reward. Motivating music students takes patience and understanding. If they’ve gone to their instrument and done something toward their pianistic skills, the goal is achieved.